I am in a modern hotel room on the 23rd floor (top) of the NHotel that occupies one of the three buildings comprising the Rem Koolhass' De Rotterdam complex. 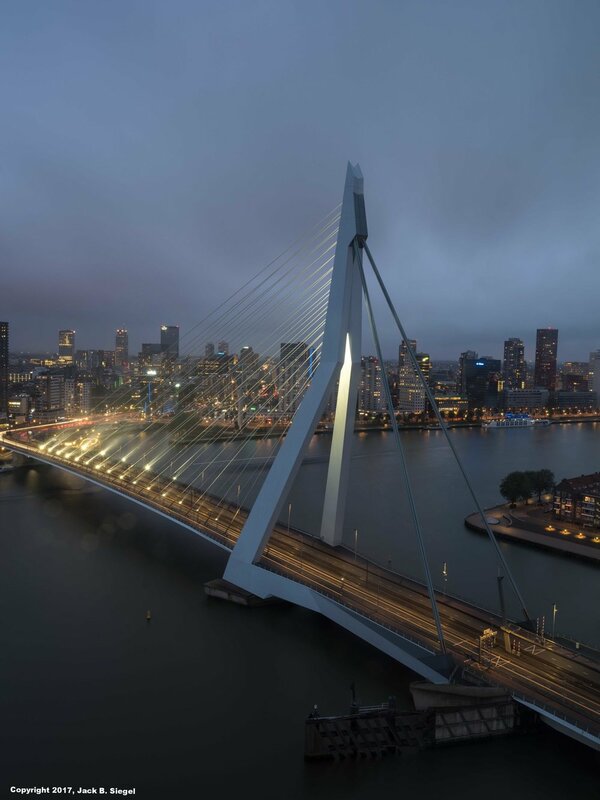 We overlook the Erasmus bridge in this thoroughly modern city. The bridge, designed by Ben van Berkel, was completed in 1996. Known as the "Swan," it is a cable-style bridge, with an asymmetric blue pylon anchoring the cables. A tram line runs down the center of the bridge, with automobile and bicycle traffic also supported. It is pouring rain, with fog and mist hanging in the air. Yet, nothing seems to stop the river traffic, with cargo container barge after cargo container barge passing by. From 1962 until 2004, Rotterdam's port was the busiest in the world. Shanghai and Singapore's ports have now overtaken it. The three photographs accompanying this post were made using a medium format camera, tripod, lens skirt, and cable release. The camera's settings were F18, 2 minute 30 second exposure, and ISO 100. And for you photography fans, our hotel is one block from the Nederlands Fotomuseum, where we spent the afternoon. Had my second look at Sebastião Salgado's Genesis exhibit. It certainly is worth a second look, but in just over two weeks, Bruce Davidson has a major exhibition at the museum. I would have preferred to see Davidson's work. We also were exposed to a wide range of Dutch photographers in two different exhibits. I particularly liked the nudes curated by Dutch provocateur Jan Cremer. The video interview with Cremer was particularly revealing. Sep 16 Hey Gene, Is It Loaded?